If you have pets (like I do), you know that our furry friends can leave pet hair on our carpets, and it’s often challenging to vacuum up the pet fur. That’s because the positive static charge from their fur is attracted to the negative charge on the furniture, carpets and even your clothes. Stubborn “stuck-on” pet hair is especially hard to clean up because it clings to these surfaces. Removing dog and cat fur can be a real challenge. 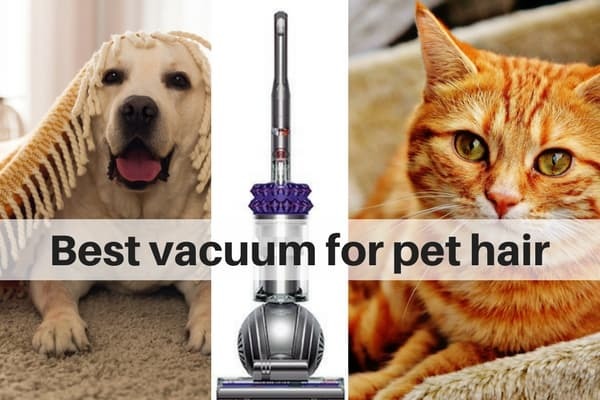 And, of course one of your best weapons is a great vacuum that is specifically designed to remove pet hair. Don’t just settle on any vacuum…believe me…most of the pet lovers out there (including me) have learned this one the hard way. 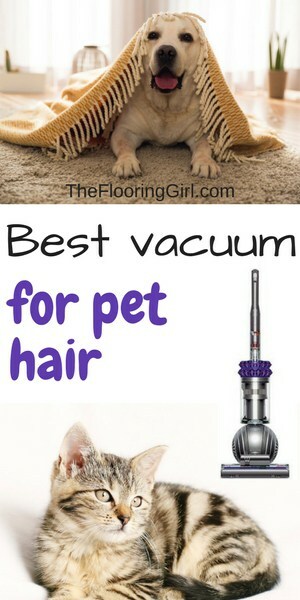 I’m going to share my top picks for vacuum cleaners if you have a dog or cat (or multiple pets). Choosing the right vacuum will make your home look and smell nicer and it will save you a ton of time. The Animal 2 is a new release from Dyson and replaces the Animal 1 and Cinetic Big Ball Animal. It is the cadillac of all pet vacuums and is superior to others on the market. It tops its competitors for power, performance and features. In fact, Dyson claims to have research showing that the Animal 2 has the strongest suction of any pet hair vacuum on the market. Pros: This vacuum combines Dyson’s flagship swivel ball for superior maneuverability and radial root technology for deep cleaning and easy operation. With an impressive 270 air watts of suction, the Animal 2 is Dyson’s most powerful pet hair vacuum to date. In addition, the Dyson has a self-adjusting cleaner base plate which enables the vacuum head to maintain close contact with the carpet, so that it gets much deeper into the carpet tufts and creates a stronger suction. The Dyson Animal 2 isn’t just for carpet, though. It has a tangle-free turbine tool which uses heads that rotate in opposite directions. This enables the vacuum to grab all of the matted hair that collects on steps, couches, chairs, beds and even clothing. In fact it comes with 6 extra tools that will enable you to get fur and dirt out of almost any crevice. Cons: It’s considerably more expensive vs most pet fur vacuums. But, its superior performance justifies the price and saves you a lot of time. It will last much longer than most other vacuums, so it will also save you money in the long run. Check the Dyson Animal in action in the below video. Another nice feature for the Dyson Animal is its patented ball technology that makes it much easier to maneuver a vacuum in tight spaces and around furniture. The Dyson Animal 2 comes complete with a 5 year warranty (which is virtually unheard of in the vacuum industry. It also has a whole-machine lifetime HEPA filtration system to capture allergens and pollen. It has a mini turbine head for cleaning corners and other hard to reach places which work with an Instant Release High-Reach Wand that stretches up to 5 times its original length. And, it’s certified asthma and allergy friendly by Asthma and Allergy Foundation of America. The Dyson Animal 2 is indeed a top of the line vacuum. The Hoover React Professional Pet Plus is a superior vacuum for pet fur and is also a great value. Their new design is perfectly engineered for powerful suction. One of the coolest features of this vacuum is their FloorSense Technology which utilizes micro-sensors that detect changing floor types, It then automatically adjusts brush roll speed for the best results on any floor type. This is an excellent choice if you have furry friends and want to make your home look and smell fresh for your guests. It’s a great value for the money. Among pet hair vacuums, the Bissell CleanView Complete Pet Rewind is probably the best budget option you’ll find. The quality is lower than the above options, but it does a fine job for the price. If you’re looking for superior suction power in your handheld vacuum, then Bissell’s Bolt Pet Cordless is a super choice. It is powerful and also has a longer run time. It costs a bit more than some of the other options, but it’s completely worth it if you have pets. This is also Amazon’s choice and one of their best sellers. It’s powered with a lithium ion batter and comes with lots of attachments specifically designed for pet fur. These tools make it easy to eliminate pet fur, even in small crevices. Also, it has an extra large dirt bin, so you don’t need to empty as often. The hand grip is ergonomically designed. This is a perfect choice for sofas, window treatments and other fabric surfaces. It often helps if you have carpet, furniture or clothes that a similarly colored to pet. It camouflages the pet fur more. Routine grooming, especially for dogs helps. Brushing your pet helps remove dead hairs before they can fall on your carpet, bedding or fabrics. And, most pets love this activity as it’s a mini massage for them. In addition, brushing also distributes the natural, healthy oils throughout their fur. Using the right grooming tools can make a big difference. For dogs that are heavy shedders, a shedding tool like the FURminator can do wonders. I was pretty certain you would say Dyson as that’s what I use, and I love Dyson products. Have you tried their hair dryer? So fast!! Definitely worth the money. Elizabeth – LOL, I figured you would have a dyson. No, I’ll have to check out the hair dryer. My hair is so thick and it takes so long to dry, so this might make a BIG difference. Thanks for the tip. The Dyson definitely is the best if money is no option, you get what you pay for! I have had a Bissell for many years and it’s always been reliable, but there is just something about a Dyson that makes vacuuming seem effortless. James – so glad you agree.